Are you looking for AM-Flow? Industrial engineering service defining, integrating and implementing tailored solutions with the AM-Flow modules based on the customers needs. AI based software platform enabling flow optimization connecting the physical, ERP and MES systems digitally and providing a user-friendly interface for the operators. Vision robot via deep learning algorithms identifying high mix and high volume of 3D-printed parts. Thus unlocking industrialization in additive manufacturing environments. Quick and careful conveyor sorter ensuring identified 3D-prints go to the correct next process step. Ideal for parts with a large form differentiation and often fragile structure. Fully autonomous, intelligent vehicles increasing throughput, while reducing transportation costs, machine idle time and allowing employees to focus on tasks that require complex human skills. 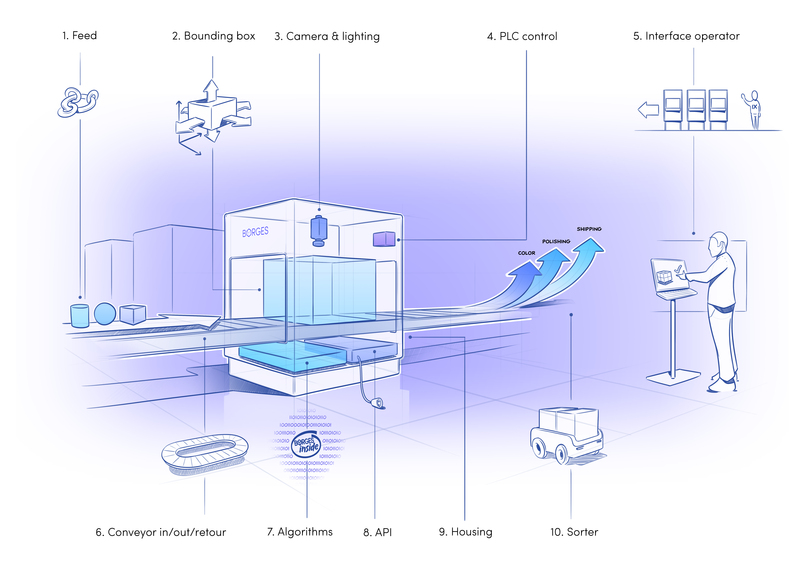 Fit-to-size auto-boxing technology measures, constructs, tapes, weighs and labels each parcel in one seamless process. We believe that everyone can be empowered to create 3D objects. No matter your design skills, technical expertise or education in complex 3D software. It is time to disrupt mass manufacturing by making product design personal, unique and accessible to anyone, anytime, anywhere. We are building towards an artificially intelligent product design assistant, that helps to democratize product design. Borges is an infinite library of 3D shapes. We created a new digital language that can express any shape and any relation between shapes, using the existing design paradigms so that we can connect different platforms. By using state of the art machine learning techniques the Borges engine learns to understand what certain classes of objects look like and how they can be connected to create new designs, both for engineering and decoration. Borges is the ultimate librarian, helping you to find any 3D object in an infinite library. Borges aims to democratize product design, so that anyone can solve their needs that require a physical solution by themselves. With digital production technologies, mass customization becomes economically and ecologically attractive. However, design for mass customization remains a challenge and user interfaces that target the general audience are notoriously difficult to build and maintain. We believe that the solution lies in a paradigm shift in the way we think about design tools and that any creative act is fundamentally a search process. The first tools that mankind used were found, not designed. A hollow tree that held water functioned as a cup, a stone was used for crushing things, and a sharp stick could be used as a spear. Only when the trunk was cut off and perfected it became a designed cup, and the stone in combination with a stick became an axe. Continuous improvements and combinations of these objects lead to a combinatorial explosion of tools that brought us enormous material wealth. We are now at the point where we can accelerate this process once again, by replicating it digitally. Borges specialises in 3D object search. We can help you improve your search results, find objects in 3D scan data, automatically classify 3D models and build specialised customizers that help you navigate the space of variations of any given model. What we offer is automated part handling with robotic AI vision system to enable part identification. Parts are currently sorted manually at 3D printing service providers. This takes time and adds significantly to the cost (40% of total fte are allocated to manual sorting in a production environment). Sorting is required as each part has a specific path through the various post-processing steps: quality inspection, surface finish, colouring, assembly and shipping. 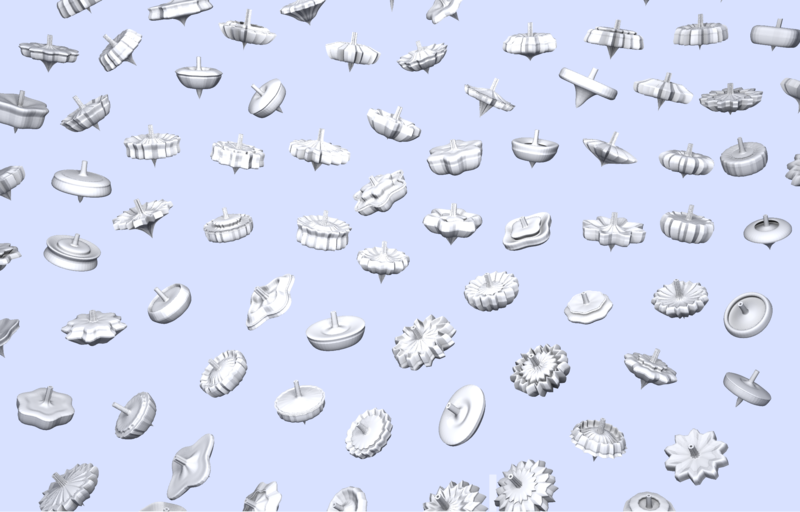 Central to the Borges engine is the capability to visually recognize the shape and function of an object. The value proposition is that we automate the sorting process with a scanrobot, reducing the time and cost of this process. This aligns well with the unique characteristics of powder-bed fusion, SLS or Multi Jet Fusion technology by HP: cost-effective, rapid and high volume production for end-use application. The Borges Vision scan robot uses the Artificial Intelligence engine designed by Borges for 2D and 3D image-recognition. This enables automation for 3D printing at lower costs, higher speeds and higher accuracy. The Borges database containing CAD templates. Each template has an intuitive user interface, designed for that category of parts. The design may be adjusted by the user, or the AI-engine may be used to generate new designs. Finally, it shows how 2D search may be used to start the design process, based on existing designs. Using the Borges engine, we built a Customizer of Customizers. With this tool, designers can quickly parameterize their design using their favourite 3D authoring tool and provide the end-user with a selective interface to adjust or add to the part-design. Since the company’s inception in 2015, the Borges team has been joined by 2 angel investors, backed by new investments from Stichting DOEN en Miller Turner. Our team of investors has a good understanding of online 3D platforms, and we’re thrilled that they join us in our mission to democratize product design. Borges and 3D Hubs joined forces to bring 3D printing to those who don’t own or have access to a 3D printer. By connecting 3D Hubs, the world’s largest 3D printing network, to our 3D discovery platform Borges, we enable our users to send their 3D model directly to a local 3D printer. A 3D print button will be featured on the Borges website, which gives users the option to send desired designs directly to the nearest 3D printer via 3D Hubs and have it made straight away. Borges and Mykoonn collaborate to develop and improve a customization application for 3D models. Mykoonn offers unique 3D printed hospitality gifts for venues like hotels and event locations. Local designers create exclusive designs for each venue. Borges facilitates the designer, the venue, the end customer and the 3D print production partner. The Borges Fusion 360 plugin easily allows the designer to assign customization to the design and automatically publishes the product in the Borges online customizer. The (white labelled) Borges customizer can seamlessly be integrated in the website of the venue. Customers can order these designs online tailored to their needs. Once the order is placed Borges sends a -ready to produce, 3D printable- file to the production partner. RWTH Aachen University is a leading research institute for applied research in Additive Manufacturing. Borges and RWTH Aachen started a collaboration on the topic of 3D printed injection moulds. Together, RWTH and Borges explore the relationship between part-design and tool-life. The knowledge gained is input for a knowledge-based tool, to enable better prediction of tool-life and optimization of part-design. In addition, RWTH and Borges are exploring the use of Borges software, in the field of Jigs & Fixtures for the automotive industry. The goal is to enable end-users to design their own Jigs & Fixtures with Borges design software. In 2015 we started working together to accomplish our mission to democratize product design. We are a passionate geeky group of designers, developers and entrepreneurs. Are you good at what you do and you would love to be part of our team? This is your chance. Apply now. We would like to meet you. Borges is currently looking for a Frontend Developer and a stagiair/trainee Digital Business Development with a strong interest in everything 3D. We are looking for someone who loves the idea of our company and really wants to be part of our design and development team. We strongly encourage collaboration and design input on all levels. This is your chance. Apply now, we would like to meet you. Borges is growing rapidly and we are looking for the brightest minds to support our growth. We offer an environment where you get to work on an exciting product that surfs the current wave of A.I. innovation, together with our experienced New Business Developer. There is a lot of room to develop your skills, and have a large impact on the new business projects. Do you recognize yourself in the following? Then please apply. Don’t recognize yourself, but think you still have what it takes? Then please apply. We look forward to meeting you! We offer an environment where you get to work with an exciting product, using cutting-edge technologies, and working with experienced professionals. There is a lot of room to develop your skills, and have impact on the New Business projects. For questions and feedback you can always contact your internship supervisor. A beautiful historic location: “The Marineterrein” on the IJ-water in the heart of Amsterdam. Internship/Traineeship allowance plus travel allowance. We are looking for a frontend developer to grow our team. Your main responsibility will be to develop new user interfaces for several of our ongoing projects, while also extending and improving the user interface of our main platform. We are looking for a mid-level Frontend Developer with an interest in design. You have two to three years of experience under your belt, and are eager to take on a more challenging project. You know how to operate within a small team of experienced developers, are comfortable working with issue trackers, and have used Git at previous jobs. In addition to these skills, you are also a team player, and a good communicator. You understand the value of well-documented code that is easy to understand by others. You don’t just implement other people’s designs, but bring your own ideas to the table, and know how to convince others of the value of your ideas. You know how to communicate directly and openly, and how to give and take constructive criticism while being considerate of your peers. More importantly than your skills, you are a quick learner. You are quick to familiarize yourself with large code bases, and not afraid to learn new technologies should the need arise. When you don’t know something, your first impulse is to figure out how to do it yourself, rather than ask someone else to do it for you! Borges has a passionate start-up culture where everything you do matters. We offer an environment where you get to work on an exciting product, using cutting-edge technologies, and working with experienced professionals. There is a lot of room to develop your skills, and have a large impact on the project. Unlike many start-ups, we take work-life balance seriously. Our engineers work from nine to six, and are not expected to answer their phone after that. Rather than making vague promises about potential stock packages, we believe in offering a competitive salary instead. Our office at the Marineterrein is in the centre of Amsterdam. Copyright © 2018 Borges. All rights reserved.